May 13th, 2013 | Children & Pets, News and Events, Wheaton World Wide Moving. 10. Get your pets used to the idea of a move. Ask any pet owner: people are extremely attached to their furry friends. These pets aren’t just the cats who sleep on the bed or the dogs that have to be taken out for walks. These animals are an integral part of a family. Because people think so highly of their Fido’s and Friskie’s, oftentimes they want to prepare their pets for an upcoming move. Wheaton understands this, and has compiled a whole list of information to help the moving process with a pet go more smoothly. 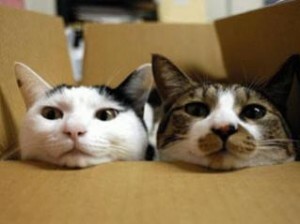 Bring some moving boxes into your house ahead of time so that your pet can get used to the idea of moving. Animals like to investigate. They like to sniff. They like to feel as if they are in control of a situation. Moves can be traumatic experiences for pets, so make sure you’re getting them acclimated to the idea. Bringing these boxes in ahead of time will allow your pet to grow accustomed to this sight and not be so frightened on moving day. Your pets might even like the boxes so much, they decide to take naps in them! Wheaton has 9 other moving tips – make sure you check them out! Getting ready to move? Visit the Wheaton World Wide Moving Web site to create your own free online estimate, or contact us today at 1.800.248.7962 to speak to a Wheaton representative about your moving needs.